Whether you are attending an important business meeting, an international conference or a religious ceremony every word can be important to your understanding and enjoyment of the event. With instant translation technology you no longer have to worry about missing out on important details due to a lapse in the interpretation time. Whether you are looking for translations to one or more languages, our instant translation equipment will allow your audience to instantly hear a speaker or presenter's words translated in real-time. >Instant translation allows for the proper understanding and engagement from all participants at an event, no matter what their native language is. Interpreter consoles allow the interpreter to have instant control over both the tone and volume of outgoing sound, allowing for transmissions to be instantly adjusted to produce the best sound quality possible. Interpreter consoles also allow the controller to turn off or turn on the input from their microphone, as well as switch the output seamlessly between different audio sources and interpreters. Multi-channel receivers also help clean and clear instant translation. By using a multi-channel receiver the controller can quickly switch between different input and output frequencies allowing audio outputs to switch between speakers and booths without experiencing lag or time lapse. Multi-channel receivers also allow translators to switch between frequencies if there is interference or static on a certain channel. An important component of instant translation depends upon providing the translator with the tools and environment they need to provide them with the right acoustics and an environment where can they comfortably manage all audio feeds. 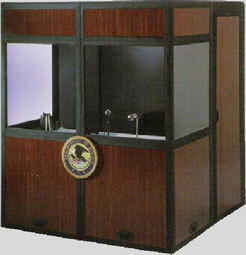 Our interpreter booths are both table top and full size, provide soundproof, mobile booths that can house up to threefour interpreters. These booths are lined with sound proofing materials that make sure the environment meets all ISO 140-4 guidelines for sound proofing and blocks all noise from outside the booth without muffling sound produced inside the booth, or altering its sound quality. Booths are well-lit and ventilated and are equipped with all the necessary equipment so that interpreters can easily and quickly carry out their work. The capacity for instant translation relies upon highly skilled translators who can clearly hear and quickly comprehend messages in the source language and simultaneously relay this message to their audience in the target language. 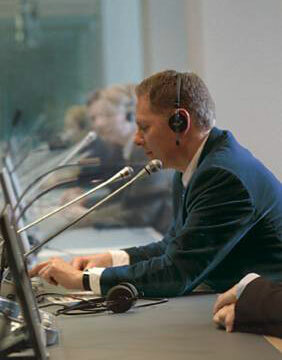 As the process is often mentally tiring, it may be best for long events or events with a large number of speakers to have several translators on hand. Translator booths can be designed to house multiple translators comfortably and provide them with ample working space and room for the correct number of transmitters and interpreter consoles. 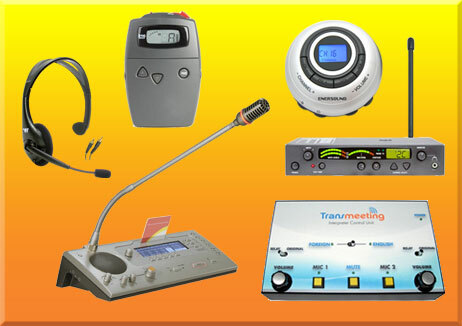 The best instant translation setups use the correct technology designed to fit the acoustics and technical capabilities of the venue. There are several different ways translation equipment can be configured. For interpretation systems that do not need to be mobile systems can be wired into the venue where they will be used. This technique will likely receive less interference as the technology is not dependent upon frequency waves, or infrared signals to relay audio between the transmitter and the receiver. However, this setup also means that a lot of work is required to move the system from one venue to another and it is certainly very expensive too. Other options include using an FM system, which is often the least expensive option and relies upon FM frequencies to pass along audio. This setup is also portable and provides the opportunity for additional channels to be added in the future. However, this setup also puts a limitation on the distance between the translator and their audience (1000ft). Lastly, you could use infrared technology to communicate the audio signals. While this setup is highly reliable infrared signals cannot pass through walls, is is more expensive than FM systems and take more time to set up. Instant translation can be a reality for your business or organization with the help of our highly knowledgeable support staff who work with you to find the right translation devices at the best prices for you. Our wide selection of products and extensive knowledge of the market ensures that you will be able to find the best products and set up to meet your instant translation needs without wasting time or effort. Visit our Online-Store to find some great offers!